SodaStream Power has an average rating of 2.8 out of 5 based on 5 user reviews. The SodaStream Power is one of the most efficient soda makers available thanks to its snap-lock mechanism and the fact that it carbonates the water with the press of a button. Plug in the soda maker and fill the bottle of water. Attach the bottle to the soda machine with the snap-lock mechanism. Press the button that corresponds to your desired level of carbonation. The SodaStream Power uses 60L SodaStream carbonators that, as their name implies, allow for carbonation of roughly 60L of water (most users do however report around the 50L range). Empty carbonators can be exchanged for full ones at various retailers such as select Bed Bath & Beyond, Costco, Target, etc. To find a retailer close to you.. Every exchange costs $14.99 but there are cheaper, DIY options. The SodaStream Power differentiates itself with its high build quality combined to its sheer efficiency and ease of use. In its price range, it has the second highest quality as well as efficiency and on top of that has a great modern design (by Yves Béhar) that allows it look amazing. 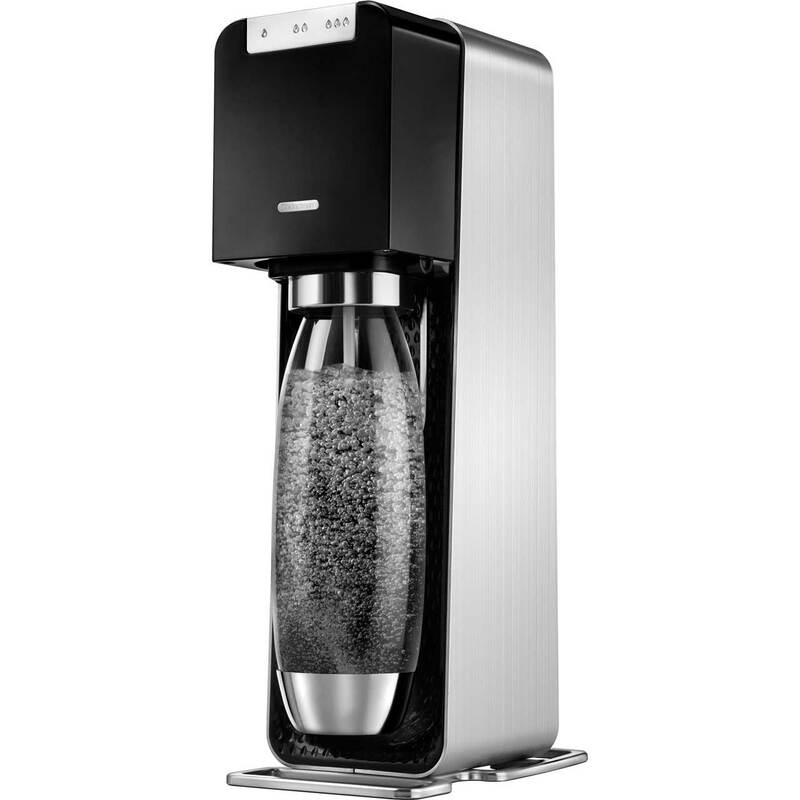 Users enjoyed the quality of the SodaStream Power, its modern design and corresponding look as well as the taste of the sparkling water it produced. They also loved the ease of use and the nearly entirely automatic process. However, one user did report that his did not work and he had to exchange it which cost him money. We bought the new SodaStream Power, since we love our current SodaStream Jet, hoping the power aspect would make it better. We used the Jet daily for years, and it has held up great with no issues. On the Jet, you manually press the CO2 button to create the fizz, where the Power model works automatically to create certain levels of carbonation with one press of a button. You plug this model in and it is sleeker than the Jet. You don’t screw the CO2 canister in with the Power model, you set it, and it secures itself. The Power model makes finer bubbles than the Jet. The Jet is great for travel or power outages since it needs no electricity and it cost under $100. The Power doesn’t seem any better to us, it just cost more. We like the Power but prefer the Jet. I am happy I switched to this machine. I don’t like appliances on my counters. I had a kitchen-aid sparkling water maker, and I liked it, but it just wouldn’t fit in my cabinets. I bought this model which is much quieter, creates better carbonation, and it fits in my cabinets! My first machine broke after three weeks, so I am hoping this replacement one will last longer because I really love it. So fast and easy to use. I buy bottled gallons of water to use for it since my tap water tastes pretty bad. Other than that, it is still cheaper and I throw out less cans and bottles. Our 3 week old Power unit has failed. 3 lights flashing. A search on the internet and FaceBook shows there are thousands of customers world wide with this same problem. Avoid the Sodastream Power at all costs. You have been warned!